The patented CT Applicator was recently approved for applying PIXY™ to seed. CT Applicators successfully apply a diversity of products quickly, easily and accurately. Tom Johnson, President of Changing Times, LLC, recently announced their dry applicator calibration numbers for PIXY™. 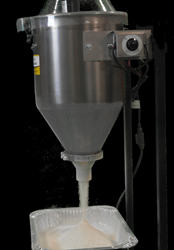 The patented CT Dry Applicator was recently approved for applying PIXY™ to seed. PIXY™, a product of Agrilead, Incorporated, is a dry powder product that is applied following a liquid treatment to speed drying, enhance seed flow and shine seed coat. The CT Dry Applicator allows precision application of low volume seed treatment products in order to achieve the highest yield response. "We are pleased to work with Agrilead, Incorporated, to ensure the best use of their product for producers,"Johnson said. Producers are encouraged to talk with their Agrilead representatives regarding their CT Applicator program. Calibration for other products can be found at http://www.ctapplicators.com. For more information or to order, please visit http://www.ctapplicators.com or call (605)878-3611.